‘BDP HDP or what should we call them’ seems to be the latest newcomer to the Turkish political spectrum. It’s not a very practical name for a political party, I have to say. 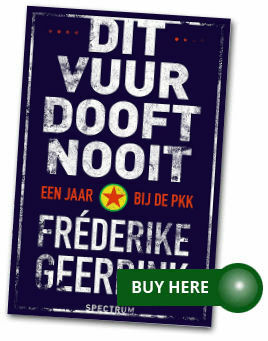 And now the rumour is that they, the politicians from BDP HDP or what shall we call them, want to change the name eventually to DTP, the name of the former and now banned Kurdish party, but then not as acronym of the then Democratic Toplum Partisi (Democratic Society Party) but of the Demokratik Topluluklar Partisi, the Democratic Communities Party. Then they would win not only the Kurdish vote, but the Turkish vote too. 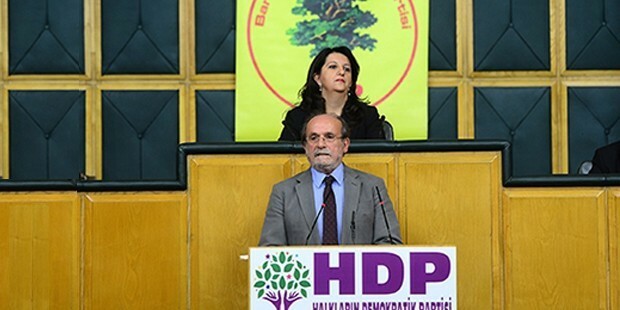 HDP co-leader Ertugrul Kückcü speaks, above him sits BDP MP Pervin Buldan, at the ceremony in Ankara where the BDP MP’s joined the HDP. Okay, let’s not try to be funny. To be honest, I think it should be applauded that a political party tries to re-invent itself and to adjust to a changing society. The BDP and its predecessors have always had the vision of a democratic society not only for Kurds but for everybody in Turkey, and the HDP was a first step to bring the Kurds together with other groups in society that fight for equal rights for everybody. But can such a party – let’s for now call them HDP – really be an alternative for Turks? I think that will be very hard. You can call it HDP or change the name to DTP, you can explain your vision for the country time and time again, but are people willing to openly listen to your message? Or will they keep seeing you as the party representing ‘baby killer Öcalan’, as Öcalan was referred to for so long? The ‘baby killer Öcalan’ sobriquet is definitely becoming less common over the last couple of years, and there are no huge rallies against the peace process, not even in the most nationalist parts of the country. But that is nowhere near enough to convince many Turks to vote for the HDP. Whatever you call yourself, the connection with Öcalan is still there, and you can tell Turks a million times that the Kurdish movement has always wanted peace and that Öcalan himself already started talking peace with the Turkish state years before he was captured, there is a long way to go before people believe it. Which is again a step away from trusting the party, which is the step before actually giving it your vote. You realize even more how difficult it will be when you know which parties people are voting for now. Many people who are against Erdogan vote CHP, often not because they want to but because they don’t know how else to vote. But still, the step from the CHP to the HDP is huge. The CHP represents the old state, still, and continues to stand for the principles of Atatürk that are the foundations of a lack of rights for many groups in Turkey. If you really want democracy, you don’t vote CHP. You vote CHP if you are against Erdogan, but that’s a completely different thing. The difference was also very clear at the May Day demonstrations that I reported on from Besiktas for Dutch radio. ‘Government resign!’ was again a much heard slogan. Not that the AKP is contributing much to democracy these days – to say the least – but how exactly is Erdogan’s resignation going to democratize Turkey? What is their alternative? The CHP? The ‘revolution’, as others were chanting for? Don’t make me laugh. In the meantime, by trying to appeal to Turks as well, the HDP risks losing the Kurdish vote. It’s very bitter, but the peace process made the BDP weaker already in some strongholds in the last local elections, like the decline in votes in Diyarbakir. The AKP is rewarded by Kurds for the absence of violence in the last year, not the party that has always campaigned for peace. Maybe they are trying to tackle this problem by focusing more on the Islamic identity of Kurds. This ‘Islamic bond’ was already present in Öcalan’s Newrozspeech last year, and this year for the first time the Kurdish movement organized rallies for ‘the birth of the Prophet’ in several cities and towns. How does this focus on Sunni Islam make Alevi Kurds feel, and Christians living in the region, and Kurdish atheists? I know how it made me feel, as an outsider: I curled my toes. Just like I did years ago, when I witnessed AKP men in suits ridiculously jumping over a fire to make people believe Newroz actually means something to them. Shallow, and not genuine. Be yourself, don’t give in to pressure to be what you are not. I respect what the HDP is trying to do. But I’m afraid they think Turkey has advanced more than it actually has. They seem to be ahead of time. I hope they will be rewarded for it but I’m not sure if I’d place my bet on it. The Turkish version of this post can be read here. “Be yourself, don’t give in to pressure to be what you are not”. This clause summarizes all political misjudgments both in ME and in EU. ME political parties are flirting with Islamic codes while EU political parties are flirting with neo-liberal outlooks. Both are doing so to attract votes. This is profitable in business but fatal in politics, I believe. It seems to me that the somewhat derogatory tone of the article towards the HDP is misplaced. The same can be said about the AKP. It is all a result of the way the law was used to outlaw kurdish and islamist parties in the past. The HDP caters to diverse groups, not only kurds, but also women groups, progressives, the young, urban professional people. All these groups are increasing as a percentage of the population. If the HDP can remain cohesive, they will have an excellant change, if not this time, then the next time.